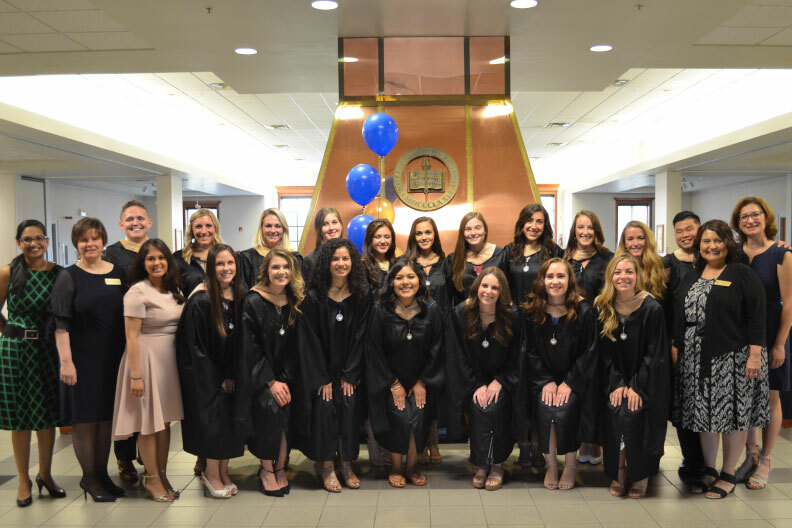 Elmhurst College’s inaugural class of occupational therapy graduate students participated in their pinning ceremony on Saturday, July 28, officially making the transition to the professional phase of their education. The 18 students in the Master of Occupational Therapy cohort took the pledge for their profession and received their pins during the ceremony, held in the Founders Lounge with about 160 family and friends on hand to help them celebrate. The students now have completed the academic requirements of the Master of Occupational Therapy program. After receiving their transcripts in August, they can apply to take the national board exams for certification. The class had a 100 percent retention rate, meaning that the students all started and finished the two-year program together. They also passed their fieldwork together, a rate that is far above the industry average.